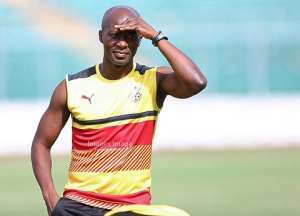 Head Coach for the Black Meteors, Ibrahim Tanko has assured that his players are ready physically and mentally for their U-23 Africa Cup of Nations (AFCON) qualifier against Gabon following the scare of a plane crush on their way to the Central African Country. The Meteors will face the Panthers to try and complete the double over them in a bid to book a place to the final round of the qualifiers to the 2019 u-23 AFCON. Ghana already leads the tie with a 4-0 win from the first leg. Ahead of the match this afternoon, there has been concerns as to the readiness of the team following the incidence that happened whiles they were travelling to Gabon on Sunday. The scare of the near crush of the aircraft carrying the team that day has many worried as to whether the players will be psychologically ready or not. Speaking to the media however, head coach for the Black Meteors Ibrahim Tanko insist his lads are ready for the clash. According to him, they have talked with all the players to psyche them up for the task ahead. “First we thank God for our lives. It was very scary but we thank God that we arrived safely and am sure some of the players will feel very bad but we are here to psyche them up”. “At least we have to talk to them so that tomorrow we will have them in a better shape to play the game. So I think we will engage them one on one to try and psyche them”, Ibrahim Tanko indicted. Making it out of this round will not only get Ghana closer to making it to the continental showpiece, it will also serve as a stepping stone to break a long time jinx and potentially make a return to the Olympic games following 15 years absence. Kickoff time for today’s match is at 14:30GMT.